Fate was not overly supportive of Boris Kustodiev. He has had a truly hungry uncertain days — two revolutions, civil war. He had to bury one year old son. Himself Kustodiev was seriously ill, in recent years, he has almost lost the ability to walk. It is not always understood and not always accepted, happened, critics called his work "the illiterate splints". But even in the most desperate times of the canvas Kustodiev was radiant with health, joy and love of life. Sugar snow and melting under the sun dome. Blazing watermelons and beauty that rivals the watermelons nor the intensity of the glow, nor smooth rounded forms. All that art historian Alexander Benois called once "barbaric fight of colors"— this holiday was with him always. When Boris Kustodiev was eleven, his older sister Katerina took him to an exhibition of the Wanderers. Picture Vasnetsov, Serov, Polenov and Shishkin stunned him — nothing like it before, never seen. It was then Kustodiev firmly decided that I would become an artist. But first he had to finish a religious school, and then attend Astrakhan theological Seminary — mother Ekaterina Prokhorovna expected Boris to continue the family dynasty and become a priest after his late father and many uncles. The first teacher Kustodiev was a graduate of the St. Petersburg Academy of arts Pavel Vlasov. This loud, heroic proportions of the people, organized in Astrakhan the Circle of lovers of painting and drawing, where Kustodiev studied the basics of the craft. Vlasov was keen to be a teacher. 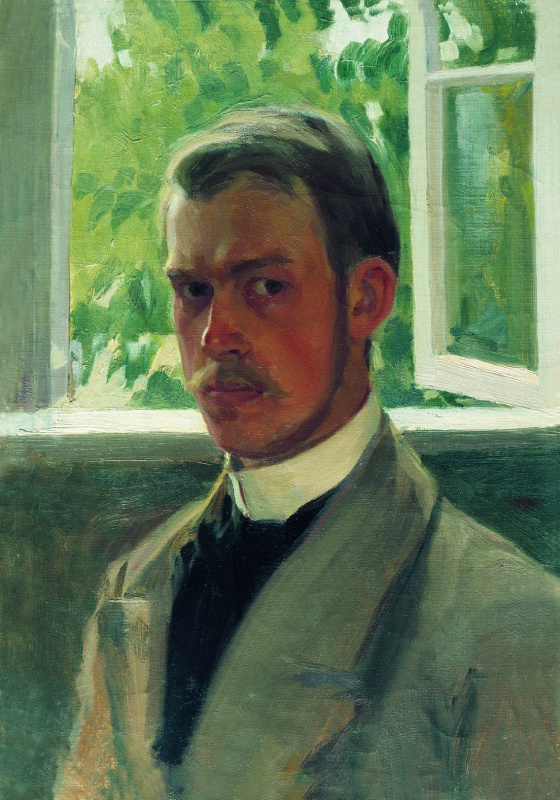 He helped Kustodiev to believe in themselves and (perhaps more important) convinced his mother that the young man must continue to study in the capital. The Moscow school of painting by Boris Kustodiev was not age — he had already turned 18. However, he was accepted into the Academy of arts in St. Petersburg, where he studied in the Studio of the Repin. In those years in teaching at the Academy there has been some stagnation. 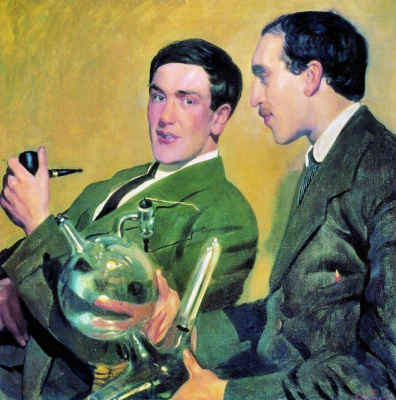 Kustodiev remembered that mentors often limited to recommendations like "there ought Pozolotina", and one of them used the definition of "chemodaniem!" students failed to understand was that a compliment or a complaint. Shortly before entering Kustodiev, Alexander III conceived reform of art education, which put simply: "Expel all, to call the Wanderers!". And Repin was given the role of such an 'spotlight perestroika". Under him Kustodiev is growing rapidly — primarily as a portraitist. He proudly wires in Astrakhan that "started making art" — sketch "In the artist’s Studio", exhibited in the premises of the Society for the encouragement of arts, brought him as much as 16 rubles. Home are delighted with its success, however, Ekaterina Prokhorovna warns the child that he is "not too admired the Nudes". In 1901 portrait of Ivan Bilibin brush Kustodiev awarded a small gold medal at the International exhibition in Munich. Ilya Repin, has received an order for an epic picture "The ceremonial meeting of the State Council", attracted to the work of two of his best students — and Kustodiev Ivan Kulikov. 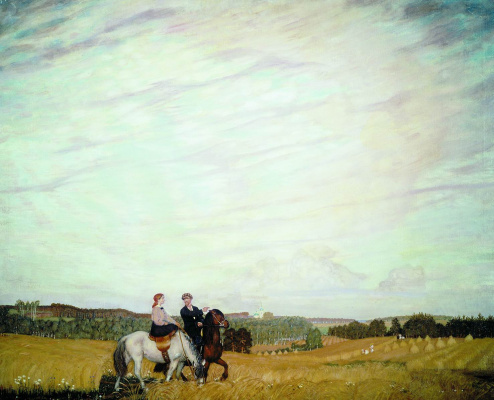 Later in the letter Korney Chukovsky Repin wrote: "Waders and Kustodiev — grew up in this picture from the great masters". 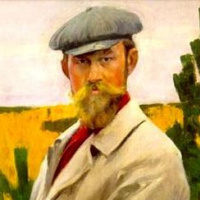 The popularity of Kustodiev grows, it is increasingly mentioned in the media. Yet life in St. Petersburg burdens. In a letter to his mother he writes: "Soon lent, spring, and Peter as if not thinking about it. It is still cold, unfriendly, he is still the same licked the face of the official, the same manner to behave like a soldier, at the seams. Today went to walk on the island, away beyond the outskirts… and repented: factories, pipes, black fences, restaurants, and everything is covered with snow, everything is dead, the trees a black wall, boring, bare: just Odori took…". Kustodiev longs for the province, he desperately lacking in its simplicity, rich colors, "the river with the green banks of the wings and sails". Any possibility he uses to escape from granite arms of St. Petersburg. During one of these "shoots" - in the estate of Vysokovo in Kostroma province — he met his future wife Julia Prosinski. Here, in the manor, which in the family Kustodiev was called "the tower", the artist feels that he is at home. 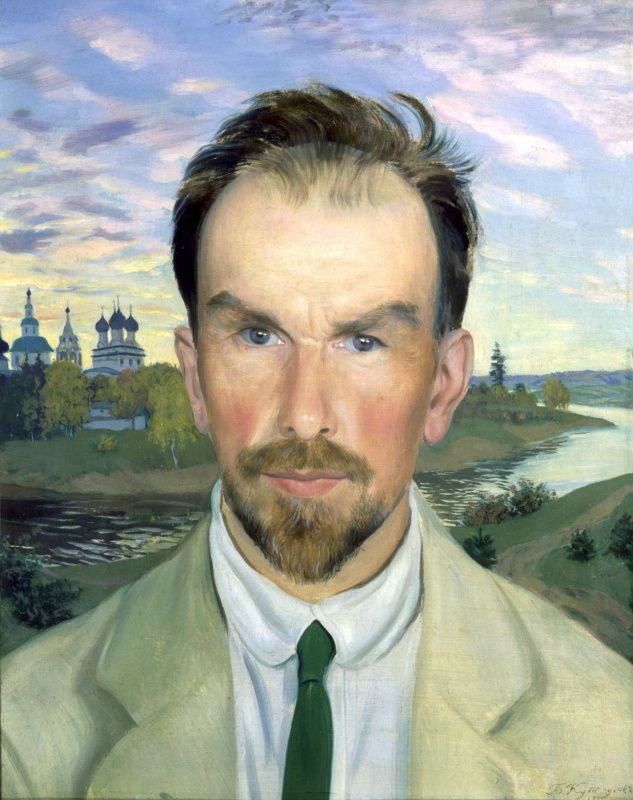 However, at home he manages to be infrequently: Kustodiev, recklessly devotee of the Russian provinces, however, wants to see the world and show the world yourself. In 1902 Kustodiev painted the Bazaar in the village (she survived), for which he received the gold medal of the Academy with the right one-year "pensioner's travel abroad, and some time later went with her family to France. It was the time of the first victories and great expectations: Kustodiev son was born, he was paid a fee of 3.5 thousand for the work on the Ceremonial meeting of the State Council", all the borders were opened before him. Not surprisingly, from Paris, he was delighted. Here he tirelessly absorb European culture and draws a lot myself. Art historians note that in Paris palette paintings Kustodiev noticeably lighter. From France artist went to Spain, which arouses mixed feelings. On one side of the Prado: Velazquez, Goya, Murillo, whose paintings made on Kustodiev a lasting impression. Another bullfight ("How strange and wildly: murder with blood — horrible and cruel!") and the Museum of modern art"Something terrible is in its ugliness and mediocrity!"). Upon returning home, Kustodiev fruitfully in "the tower", reveling in the beauty of their homes. Things are going well: his paintings are willing to buy the museums, kindly write in the foreign press. Over St. Petersburg, meanwhile, gathering clouds: the country covers the revolutionary fever. Because of the excitement among students, the Academy of arts was closed — the lessons were resumed only in 1906, the year. 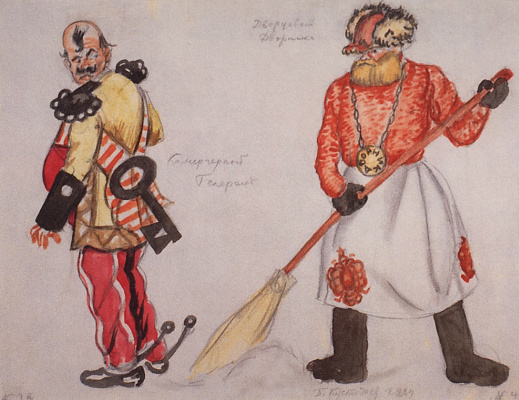 Kustodiev rarely expressed their political views. But anti-government sentiment, possession of workers, students and the radical intelligentsia, he certainly sympathized. 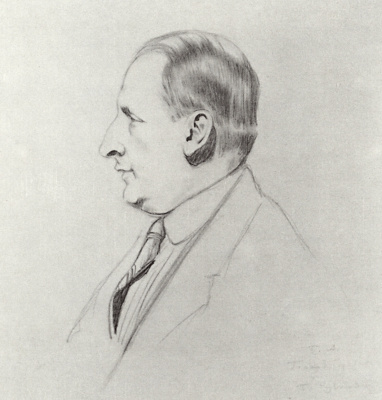 When an old friend — Ivan Bilibin — suggested Kustodiev to enter the editorial Board of the magazine "Bogey", he agreed with enthusiasm. The theme of his first picture "Introduction" he chose the suppression of the uprising on Krasnaya Presnya. 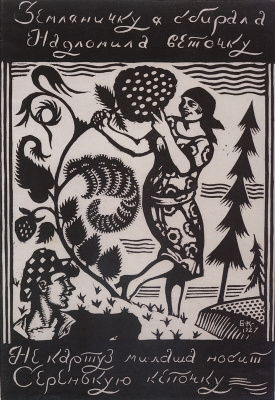 The magazine soon closed, Bilibin was arrested. However, for the "Bogey" was followed by the magazine "Hell-mail," in which Kustodiev distinguished caricatures of count Ignatiev, chief Procurator of the Synod of Pobedonostsev and many other heroes Repin paintings, "the Ceremonial meeting of the State Council". "Hell-mail" suffered the fate of the "Bogey": print run was confiscated, and the magazine closed. As for Kustodiev, the authorities turned a blind eye to his "opposition pranks": too obvious and valuable was his talent. In 1906 Kustodiev received government contracts: the 100th anniversary of the Finnish regiment, the artist was commissioned to paint portraits of its founder Alexander I and Nicholas II. 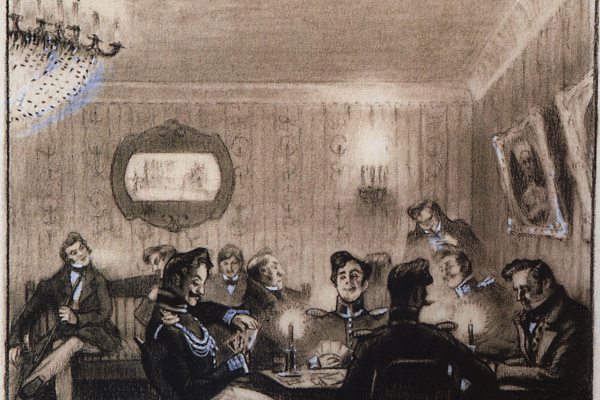 And, in addition, a painting depicting the scene of the first performance regiment their boss, Tsarevich Alexei. Kustodiev doubted not for long: it was about the glory of the Russian arms, besides the one who writes the sovereign and members of the Royal family, always in demand eminent customers. So, having started the year with a provocative cartoons, Kustodiev graduated to the status of a court portraitist. Of course, Boris Kustodiev had to deal not only with admiration of critics and public recognition. As usual, some criticized him for exactly what others are praised. If there were those who believed Kustodiev worthy successor to Repin, there were those who blamed his portraits for "lack of Repin psychologism". 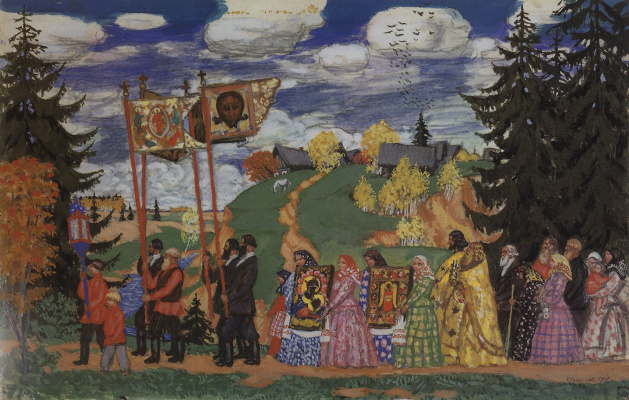 Alexander Benois argued that the real Kustodiev, "his field and his joy is Russian fair, pestravka, "big-eyed" chintz, barbaric "fighting colors", Russian Posad and Russian village, with their harmonics, cakes, overdressed girls and dashing boys". 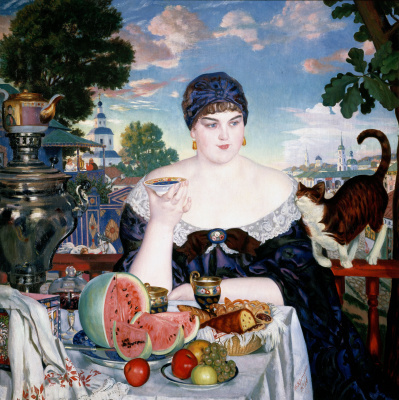 At the same time the number of members of the Academy of arts took her position in protest against "shopping for the Museum of the Academy Kustodiev popular prints". But neither fierce criticism nor geopolitical disasters or serious illness could not dampen the creative thirst Kustodiev. Enthusiastically met the 1917 revolution, he soon gave up on the Bolsheviks. But stayed at home and continued frantically to work. His illness, which first became known in 1907, is progressing. Since then, doctors diagnosed Kustodiev a tumor in the spinal canal, surgery followed one after the other, but brought only temporary relief. During one of them has become clear that you have to cut the nerves and to choose what to save — the mobility of the feet or hands. Wife Kustodiev Julia (the artist himself was under anesthesia) decided: "Hands leave, hands! Artist — no hands! He can not live". 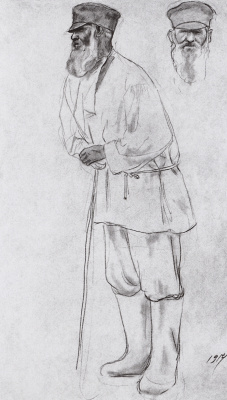 Kustodiev gave up and being confined to a wheelchair. Moreover, during this period, he created perhaps the most positive and light-filled canvases (1, 2, 3). He kept courage, love of life, sense of humor. When visiting his friends tactfully hinted that it was time for him to relax, he tried to persuade them not to leave so early. And when they transported him to a chair in the bedroom, joked: "Not Cassibile, I’m a glass!". 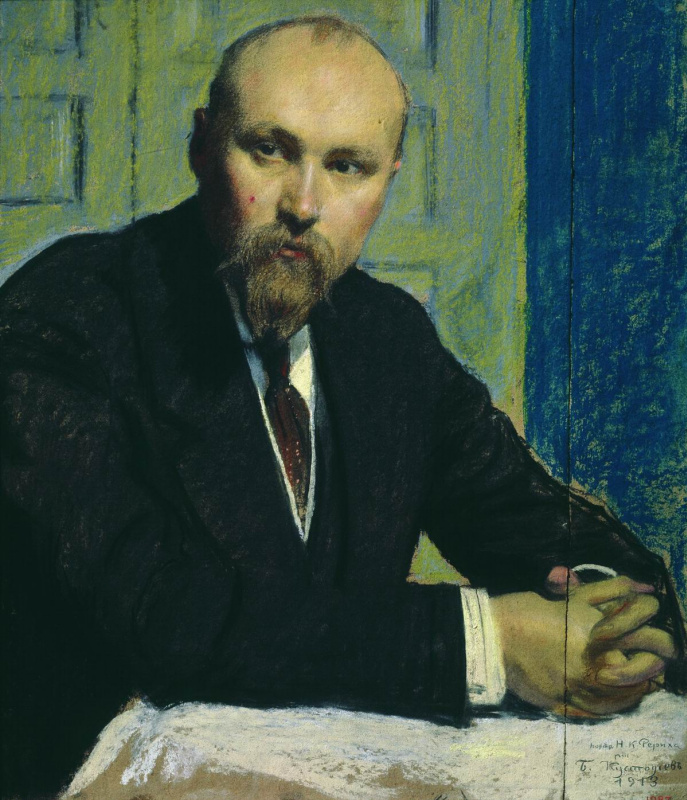 In 1927 the Soviet government allocated money for the treatment of the artist in Germany, but Kustodiev did not live to travel a few days. According to his daughter Irina, before the death of this flatly refused to aging people read "the picture of Dorian gray". The game of whist. 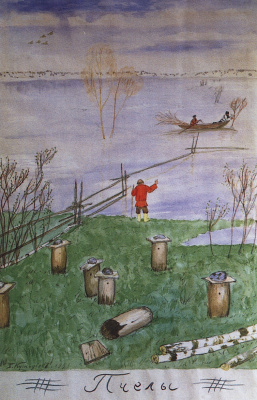 Illustrations to N. V. Gogol's story "Carriage"